Welcome to SitcomsOnline Digest! It might come as a shock, but reboots are news, again, including even a pilot being proposed at Fox that is about a guy who is dealing with being reunited with his childhood sitcom family when it gets rebooted (can it get more "meta" than that?). Plus, we're hearing that Living Single will be continuing on DVD, finally. Let's get going! Warner Archive has been hard at work trying to get some abandoned Warner Home Video series continued on DVD, and this week, it was announced that Living Single would continue, with Living Single - The Complete Second Season, set for a September 19 release. 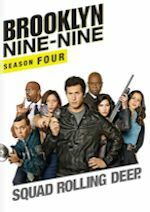 Brooklyn Nine-Nine - Season Four (DVD, $39.98): It's hard to believe this series has already been going for four seasons, with a fifth on the way, but the fourth one arrives on DVD in this release. Who to Follow: Sherri Shepherd (Twitter), "I make stuff up for a living. It's not real, okay? Don't tweet me your craziness." Claim to Fame: Shonda Rhimes got her start in films, and one of her first gigs was one that was so bad that it could have very easily ruined her career, as she wrote the Britney Spears movie Crossroads. She was a little lucky, though, as that train wreck didn't ruin her career. She was able to move on to television, where she has thrived as creator and producer of successful series such as Grey's Anatomy and Scandal, among other series. She made news this week, though, in that she would be taking her talents to Netflix for her new series. However, the series that have started at ABC will continue at ABC.